We all know a great leader when we see one, but pinning down exactly what makes a leader effective and inspirational can be a difficult. This course breaks down the specific traits that characterize successful leaders and shows you how you can lead your team to greatness - and how to train leaders to inspire and motivate others. You'll learn the four 'giant steps to leadership;' the characteristics of effective teams, team members, and leaders; and how to improve communication across an organization. This course also covers how to deliver constructive feedback and how you can use the DISC personality profile to improve productivity and mutual understanding. 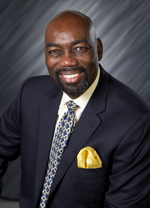 Ed Robinson, CPA, CSP, is a highly recognized international speaker, business-growth coach, and author. A “recovering CPA” with an engaging personality, Ed has a wealth of experience and is a proven leader. His audiences leave with a renewed commitment to professionalism and success. President and CEO of Robinson Performance Group with over 30 years’ experience in professional service organizations, Ed provides unique growth strategies and leadership consulting to businesses. Many of his clients experience a dramatic increase in revenue production by applying his ideas and teachings. Ed is a certified professional speaker (CSP), a designation of the International Federation of Professional Speakers. Only 10% of its members have earned this prestigious designation. Having spoken in over 25 countries, Ed is sought after globally for his speaking, coaching, and rainmaking techniques. Identify the four giant steps to leadership and what they include. Recognize the components of the high performance leadership model and what they mean. Recognize the characteristics of effective teams, team members, and team leaders. Recognize the formula and elements for success. Recognize the rules and stages of communication and how to communicate as an adult. Recognize when to provide feedback, the rules for giving feedback, and the stages of receiving feedback. Identify the basic DISC behavioral characteristics and psychological needs, what DISC behavioral profiling measures, and the steps involved in using behavioral profiling to improve communication within a team.